Everyone has their own way of working with new clients and quoting on gigs. 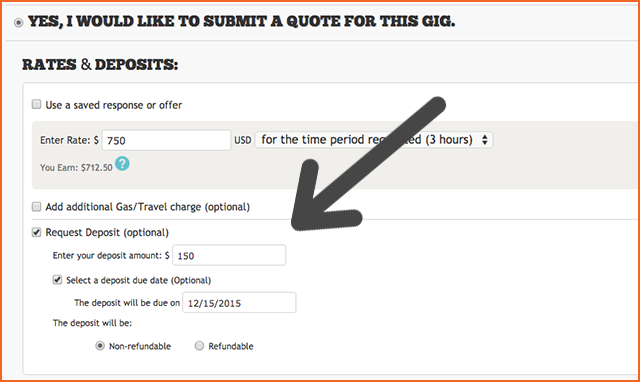 That's why GigMasters allows vendors to customize quotes and request deposits as an optional feature. We all know that deposits benefit the vendor, however, some are concerned that asking for money up front could scare away clients. Don't be scared! The consensus, based on member feedback, is that deposits are highly recommended. Most clients are willing to put money down to secure the date and know that the booking is official. After all, their private event is a very important moment in their life. 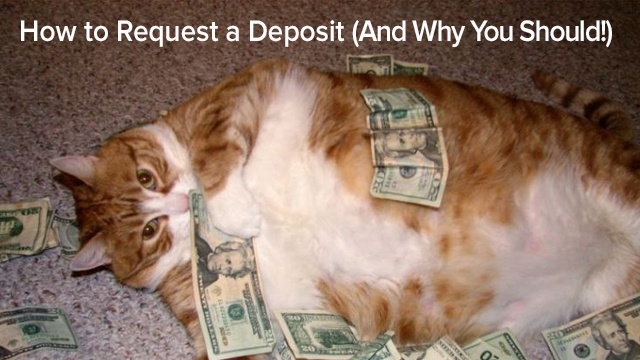 And of course, deposits protect the vendor (you) in the case of a cancellation. Let’s hope that doesn’t happen, but if it does it's better to have something to walk away with. The amount is up to you and it really depends on your event rate. We generally see 10-50% as the going rate, and round numbers like $100 and $500 are very common. Payment due dates are optional too -- this really depends how busy you are. If your schedule is open and the event date is far away, you may want to give the client more time to decide. You can always resumbit your quote in the future if another gig opportunity comes up. Copyright © 2015 GigMasters, Inc. All rights reserved.